This beautifully illustrated book draws on the latest archaeological discoveries to present a radical reappraisal of the Anglo-Saxon built environment and its inhabitants. John Blair, one of the world's leading experts on this transformative era in England's early history, explains the origins of towns, manor houses, and castles in a completely new way, and sheds new light on the important functions of buildings and settlements in shaping people's lives during the age of the Venerable Bede and King Alfred. 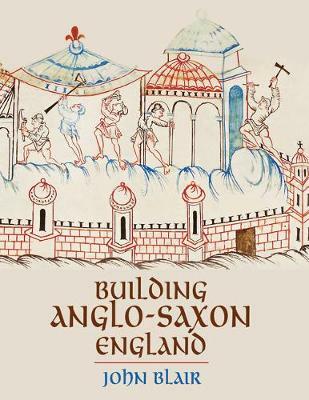 Building Anglo-Saxon England demonstrates how hundreds of recent excavations enable us to grasp for the first time how regionally diverse the built environment of the Anglo-Saxons truly was. Blair identifies a zone of eastern England with access to the North Sea whose economy, prosperity, and timber buildings had more in common with the Low Countries and Scandinavia than the rest of England. The origins of villages and their field systems emerge with a new clarity, as does the royal administrative organization of the kingdom of Mercia, which dominated central England for two centuries. Featuring a wealth of color illustrations throughout, Building Anglo-Saxon England explores how the natural landscape was modified to accommodate human activity, and how many settlements--secular and religious "were laid out with geometrical precision by specialist surveyors. The book also shows how the Anglo-Saxon love of elegant and intricate decoration is reflected in the construction of the living environment, which in some ways was more sophisticated than it would become after the Norman Conquest. John Blair is Professor of Medieval History and Archaeology at the University of Oxford and Fellow in History at The Queen's College. His books include The Church in Anglo-Saxon Society and The Anglo-Saxon Age: A Very Short Introduction.